A lot of dead Flowers but one did survive. That´s what we found on our Journey through the Animal Park of Mölln. The Photo is in bad Quality and somewhat blurry but the Scene is cool anyhow. I mean it´s really funny that there are so many dead Flowers but one did survive. 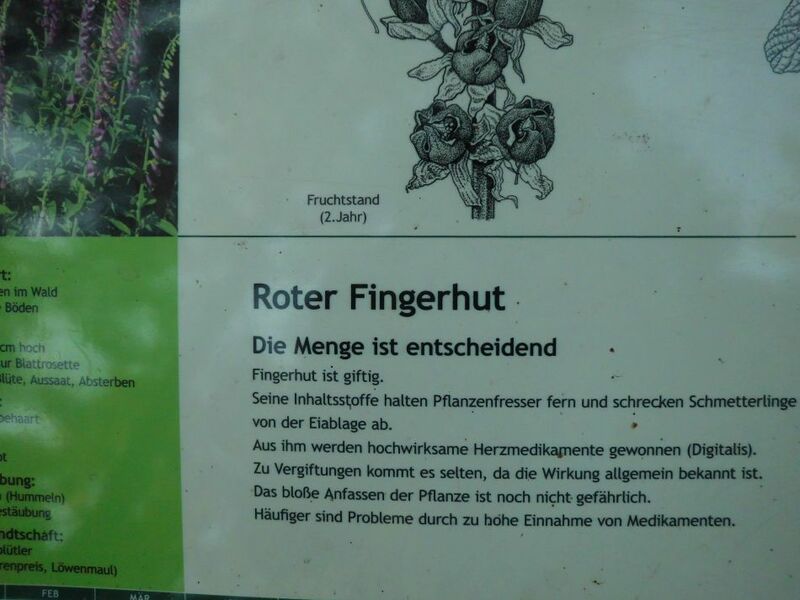 There was a Sign which said it is a Common Foxglove, Lady´s Glove or Purple Foxglove (These are the Translations I found from german to english). I was suprised that the Flower is called Purple Foxglove as the Flower is white. I just can see three Reasons here… The Flowe is either not bloom in the original Color anymore due to the Autumn or it is a differend Foxglove but not a Purple Foxglove or maybe I just did make a Photo of the wrong half of the Sign as it seems that there was another Plant descriped on the Sign as well. Maybe it´s my bad, because there were many Signs around this Area. It´s sad. I dont know. I would rather call this Plant White Foxglove, *laughing*. 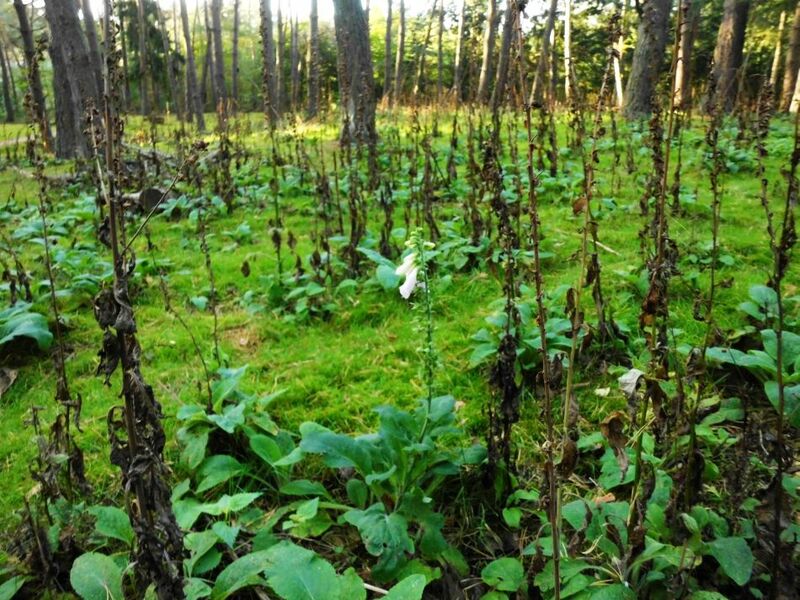 Foxglove is poisonous. The Ingredients of the Foxglove do keep away Plant Eater and discourage Butterflies from Egg Tray. Ingredients obtained from the Foxglove are used and processed to highly efficient Cardiac Medications. Toxication doesn´t happen often because the Effect of the Plant is commonly known. Only touching the Plant is still not dangerous. More frequent are Problems due to the Ingestion and high medication. I just can say that the Season was already to late to enjoy the appearance of the Flowers there. We found so much other great Things there but most of the Flowers were already dead. We visit the Place next Year in the Summer again, I am sure. The foxglove is usually purple or pink but you do get white ones too, they are all the same, probably more to do with how much sunlight they get more than anything else. Most of the ones in my garden are purple! That could explain it with the colors! It´s not so viewable on the photo but there was not much sunlight coming through all the trees. Only in the background was more sun light. But still a great plant even in white. I will visit the same place next summer again to see how it looks there then. Our visit was to late I think. I would like to make a photo of the plants there when they are still alive. About the effect… I heard that some crazy people use these flowers to get drugged too and to get their trip. That is so crazy considering that the plant can kill you pretty easy like you mentioned and like readable on the sign. Risking a heart attack to get a nice trip is just extremely stupid. I don’t know much, but I think you would probably have to eat a decent amount to get a heart attack. Saying that I wouldn’t eat it myself, each individual is different, you never know how a poison could affect you!